Do not stick posters over one advertising an event that is still current. Your poster for one event should not be bigger than A3 size. Your poster for up to six events should not be bigger than A2 size. Do not post more than one poster. Do not put up a poster for an event more than 6 weeks ahead. No racial or offensive material should be posted. 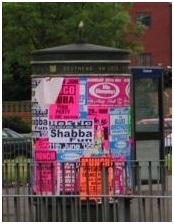 Post edge to edge; it's tidier and stops people from tearing down posters by the corners. These posters are monitored. If you do not follow these rules your poster will be removed by us. Please note: they are cleaned periodically. Hamlet Court Road, Westcliff-on-Sea Notice Board at South end on the West side of road bridge, facing onto the Queens Hotel site. High Street, Southend-on-Sea Drum at junction with Elmer Approach. High Street, Southend-on-Sea Drum at junction with York Road. London Road, Leigh-on-Sea South side in front of car park adjoining the old service station. London Road, Southend-on-Sea Drum at junction with College Way. London Road, Westcliff-on-Sea North West junction with Hamlet Court Road next to pedestrian access to car park. London Road, Westcliff-on-Sea South West junction with Crowstone immediately behind bench seat. Lucy Road, Southend-on-Sea Notice board on Southend boundry of Seaway Car Park opposite Talk. Prince Avenue, Southend-on-Sea North West junction with Rochford Road in front of access to pedestrian bridge. Rectory Grove, Leigh-on-Sea Drum on Northside with Post Office. Southchurch Road, Southend-on-Sea South side in front of car park between Ilfracombe Avenue and Bellvue Avenue. Victoria Avenue, Southend-on-Sea Drum at South West corner outside Customs and Excise Building. Victoria Avenue, Southend-on-Sea North West junction with West Street in front of brick wall. We also own and manage a number of A3 Poster sites which are used to advertise artistic and cultural events taking place around the town. Arts organisations can apply to hire space on these sites, which are situated on park railings, along the seafront and at a variety of other sites around the town. You must book a space before posters can be put up on the poster boards and these must be put up by a council official or contractor. For further information and details about how you can pre-book a space see the Martin Woods events website.